Of course with the announcement of Windows Phone 8.1 XAML applications (ie applications for WP8.1 written in Windows XAML) and support for Universal applications, not everyone is going to immediately rebuild their Windows Phone application. Instead, existing developers need a mechanism to upgrade to the new runtime to leverage the new features without having to redeveloper all their pages. This is where Silverlight 8.1 applications come in. 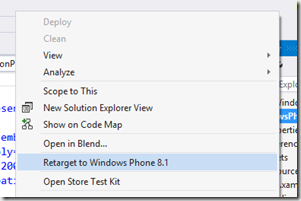 There is only minimal support within Visual Studio to support developers upgrading to Silverlight 8.1, allowing them to “Retarget to Windows Phone 8.1”. Retargeting works well and typically your application will continue to run. However, in most cases you’ll want to maintain both a Silverlight 8.0 and 8.1 versions of your application. An alternative is to create a copy of your Silverlight 8.0 application and upgrade that – now you have two versions of your application that you have to support. 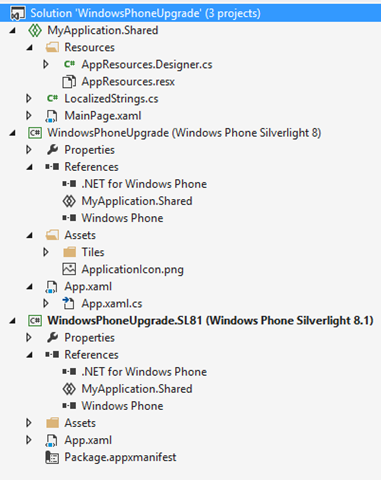 Luckily this is an area where the new Shared project support, added to enable universal applications across Windows Phone and Windows, can be used to maintain code that is used by both a Silverlight 8.0 and 8.1 application (sort of Linked files on steroids). > AppResources.resx doesn’t move easily. You’ll need to make sure that both the resx and the designer.cs file are moved and that the Build Action is correct (resx file should have a Build Action of Embedded Resource and a Custom Tool of PublicResXFileCodeGenerator). You also need to remove the “.Resources” from the name of the resource being loaded and the namespace. 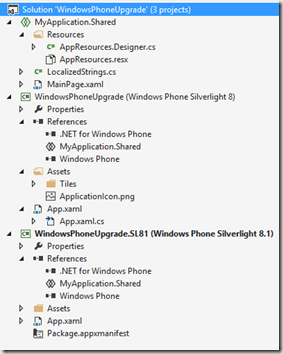 The upshot after all this is that you have a Shared project where you can store shared files across your Windows Phone Silverlight 8.0 and 8.1 applications. 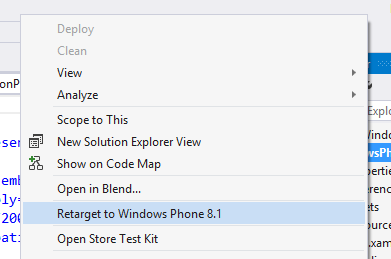 I wish we could use the shared projects with WP7 apps too. I know 8 & 8.1 is where it's at, but I've still got a few 7 apps I want to maintain as well as provide 8 & 8.1 versions too.